Angelina Jolie is action woman in Salt but what about Sigourney? Which we all know isn’t true. Sigourney Weaver was at Comic-Con last year, she was voted the greatest female action hero of all time for her role as Ripley in the Alien franchise. But we all know this. Ah well, let the PR role. 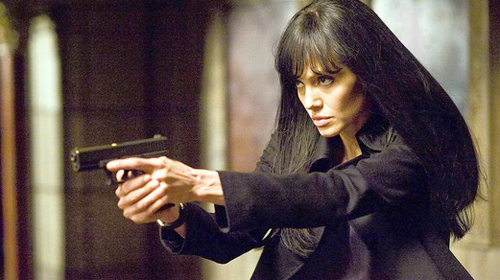 Of course, what the LA Times is really getting at is the star power of Angelina Jollie in an action role. The trades say it better. Jollie is selling tickets as a bona fide action hero to rival the guys and she is the only woman to do this, hence her $20 million price tag. Image: Todd Wawrychuk / ©A.M.P.A.S. Academy Award nominated actress and star of best picture nominee “Avatar,” and producers Adam Shankman and Bill Mechanic were busy promoting the 82nd Academy Awards for a satellite tour held today at HD Vision in Studio City, CA. The 82nd Academy Awards kick of Sunday March 7th live from Hollywood at 5.00pm PST. Join me “Under the Goodyear Blimp” where I’ll be reporting on the winners as they happen. Talks of an Alien prequel have surfaced again, this time both Ridley and Tony Scott are behind the project and giving director reins to Carl Erik Rinsch. But Fox, who own the rights to the franchise, want Ridley Scott to use his unique directorial vision, as he did in the first Alien in 1979 which starred Sigourney Weaver. And as Rinsch is only known for his futuristic commercial work, it is Ridley Scott who has the name and the power punch to bring back this franchise to the excited masses.